What if a battalion of Virginia Cavalry reenactors was actually an active military presence with connections to the still surviving Confederate Government? While the modern form of Civil War reenacting began in 1961-1965 to commemorate the Civil War Centennial, realistically there had been forms of reenactments that existed shortly after the war ended as a way to remember those that had fallen. In the modern day many people have attached unflattering images and stereotypes to memorabilia of southern heritage such as the old battle flag, historic monuments and those who celebrate these representations of American history. In truth, enthusiasts of southern history are entirely post-racial and simply seek to revisit the past through study, and in the case of reenactors or living historians, through elaborate recreations of the battlefield civil war experience. Most reenactors focus on those southern leaders who denounced slavery and wished it gone, such as R. E. Lee. “The Confederate Chronicles” explores the idea that the southern government of 150 years past never disbanded, but instead repurposed itself to provide aid and assistance, anonymously, to southern citizens of all stripes all the way up to today. What if a battalion of Virginia Cavalry reenactors was actually an active military presence with connections to the still surviving Confederate Government? What if they uncovered a terrorist plot to attack Washington and foiled it? What would happen if the ATF mistook a reenactment unit for domestic terrorists and assaulted a unit of Cavalry reenactors? These are just a few of the quandaries presented by Parker in his new series, but above all else he wants readers to enjoy a fun, action-adventure novel with a few historical facts and characters to learn from. “Learning the stories about what have simply become street signs and park names can help us forget the trending obsession with modernizing and allow us to revel in the past, if even for just a moment,” Parker said. 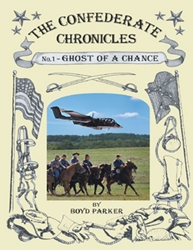 Boyd Parker is a Washington, DC native with experience as a pilot, horseman, firearms enthusiast, amateur historian, Virginia historical sights, commercial real estate, business writing and is a fan of Civil War reenactments.